Christmas has only just past but we are already looking forward to next year! Now is a great time to take advantage of our great value Christmas and New Year prices for 2019/2020! Without a doubt this is the most magical time of the year in Morzine; vin chaud by the fire, horse drawn carriage rides, Father Christmas skiing down the Pleney piste! Without a doubt – January is one of the best times of the season to ski. Not only are the flights cheaper, the slopes see fewer crowds, and it’s more snow sure! If that wasn’t enough – we are now offering 25% discount on all our remaining January weeks. Please use promo code: JAN19 to take advantage of this offer. You will also benefit from 10% discount on your ski passes as well as great deals on ski hire and airport transfers too! March is one of the most fantastic times of the year to come skiing. It is usually wonderful weather on tap with lovely snow on the slopes! It is a great time of year to learn or perfect your skiing or snowboarding skills with some private lessons! We are now offering 20% discount on all our remaining accommodation taken between 16th March – 31st March 2019. Please use promo code: MAR19 to take advantage of this offer. We are offering 25% discount on all remaining Easter weeks from 1st April – April 21st 2019. These discounts have already been applied to the properties’ prices. 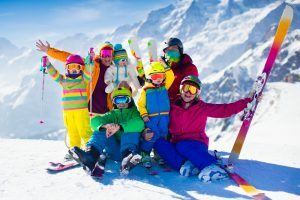 The Easter bunny also has a special gift for Alptitude clients this Easter – with every 6 day adult lift pass purchased from 30th March 2019, you’ll get an Under 12’s kids lift pass free! Please order the adult passes on your booking page and then email us with the childrens requirements. That’s a saving of up to nearly €200 per child if you’re skiing for 6 days! With great sunshine, fresh Spring snow and quiet slopes – what more could you wish for? !